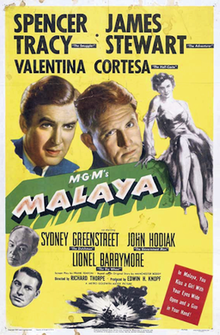 Malaya is a 1949 war film starring Spencer Tracy and James Stewart and set in colonial Malaya during World War II. It was directed by Richard Thorpe. The supporting cast includes Lionel Barrymore, Sydney Greenstreet, John Hodiak and DeForest Kelley. In January 1942, a month after the United States entered World War II, reporter John Royer (James Stewart) returns to the United States. He goes to see his friend, newspaper publisher John Manchester (Lionel Barrymore), about a scheme to smuggle desperately needed rubber out of Japanese-occupied Malaya. Manchester, though he has been selected by the government to deal with the rubber shortage, does not seem interested, but later, government agent Kellar (John Hodiak) takes him to a meeting with Manchester and others. They give their approval. Royer needs the help of his old friend, Carnaghan (Spencer Tracy); he gets Carnaghan released from Alcatraz (where Royer's newspaper exposé had landed him) to help. They slip into Malaya and contact Carnaghan's associate, the Dutchman (Sydney Greenstreet), who conveniently recruits a gang of cutthroats for them from customers in his saloon, including Romano (Gilbert Roland). Carnaghan also renews his acquaintance with the saloon's singer, Luana (Valentina Cortese) from Italy. Using money and intimidation, they succeed in purchasing all the available rubber, but eventually the Japanese commander, Colonel Tomura (Richard Loo), gets wind of the scheme. On the last trip to transport the remaining rubber belonging to part-German plantation owner Bruno Gerber (Roland Winters) to a waiting freighter, Carnaghan smells an ambush. He forces Gerber to confess that he tipped off Tomura. Royer decides to try going around the ambush, but is killed by the waiting soldiers. Tomura hints to the Dutchman that he would be willing to look the other way and let the rubber go in return for gold. Despite the Dutchman's certainty that Tomura is lying, the cynical Carnaghan takes him up on his offer. The Dutchman is right; Carnaghan is captured by Tomura. He takes Tomura to where the freighter lies hidden, but when a Japanese warship arrives, it is met by two PT boats, which proceed to sink it with torpedoes. Carnaghan shoots first the soldiers guarding him, then Tomura, but is himself wounded. When Malaya is liberated by the Allies, Kellar tracks Carnaghan down to an island, where he has settled down with Luana, to give him a medal. Carnaghan refuses the medal, and tells Kellar to give the medal to the Dutchman. Sydney Greenstreet as The Dutchman. This was Greenstreet's last picture. The film was based on Manchester Boddy's plan to get rubber out of Japanese-held Malaya after a fire destroyed large part of the US government's supply of raw rubber at the Firestone Tire & Rubber Company's plant in Fall River, Massachusetts. The character "John Manchester," portrayed by Lionel Barrymore, was based on Boddy. The film was originally developed by Dore Schary at RKO under the title Operation Malaya. Howard Hughes rejected both Operation Malaya and Battleground, which led Schary to Metro-Goldwyn-Mayer. The film was completed at MGM in late 1948 and delayed release due to hesitation about making a film about World War II. This was the first time James Stewart worked with Spencer Tracy since his debut feature film, Murder Man, in 1935 in which he had a minor role, as Shorty, and had sixth billing. According to MGM records the film earned $1,959,000 in the US and Canada and $1,128,000 overseas resulting in a profit of $691,000. This page was last edited on 14 February 2019, at 16:18 (UTC).